It's not called Wheaton Plaza anymore, but it's still open tonight til 9:30. I'm pretty satisfied with it. The design printed clearly, can be recognized from far away, and closely resembles the original sign. I've even got a small, tasteful plug for Just Up The Pike in the corner. Last night, I decided to wear it to Greater Greater Washington's 5th birthday party. I've been contributing to GGW for the past 4 years, and I'm always amazed to see the community David Alpert's built both online and in person. It was a big gathering, but somehow my shirt and I made their way into a number of photos, including hiding behind D.C. mayor Vincent Gray and hobnobbing with my fellow contributors. 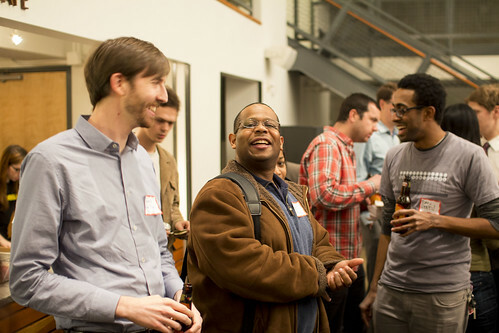 That's me on the right, talking with GGW contributor Bradley Heard. Photo by Aimee Custis. 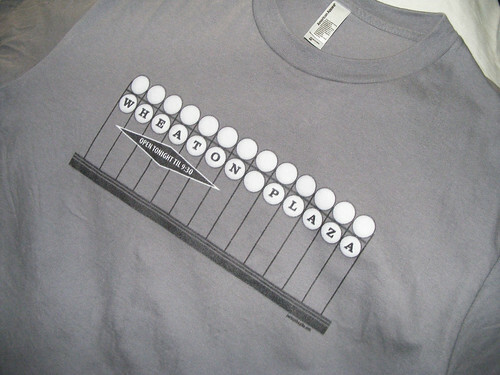 One person who lived in D.C. asked me if there were people "obsessed enough with Montgomery County" to want a Wheaton Plaza shirt, but judging from the mall's 800 fans on Facebook, I wouldn't be surprised. To many people who grew up here back in the day, the mall was an important place in their life and arguably a part of our local culture that's worth celebrating. Though Wheaton Plaza isn't called that anymore, and the sign has been gone probably as long as I've been alive, people remember it. Both of my parents used to shop at Wheaton Plaza back when it was a "whole new shopping scene" and when I showed them the sign, their eyes lit up like they'd seen a long-lost friend. Besides, even if you've never been to Wheaton Plaza or care about it, thee design that pays homage to midcentury modern design, which has its fans in Montgomery County and beyond. 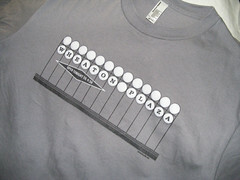 A number of commenters expressed interest in buying my Wheaton Plaza shirt, so I'm setting up a store on Spreadshirt to sell it; in case you don't like grey, I'll have it in a couple of different colors. I'd like to make a few changes to the design before making the store public, but I hope to to have it ready soon. I'll let you know when it's done! If it's successful, I might make designs for other local landmarks. I will definitely buy one. That's an awesome shirt! Well done! Must have! Must have several! I will buy one too! An excellent way to pay homage to THE middle school hangout spot. I recently came across your site... just today actually. I was bored at work and was searching for pictures of places in Gaithersburg at various periods (with no such luck really). So instead I decided googling various landmarks instead that were familiar to me as I was growing up. For some reason, I started with the Anchor Inn and it grabbed so many various images. Just general Wheaton/Silver Spring stuff (which was great). And I was just hooked on your blog site. And the sign took me to your shirt design. You have a point: There deffinitely is a niche to appeal to. I definitely wasn't around when that sign existed (I only remember the strange, folded octagonal logo/emblem). But I'm a total fan of nostalgia stuff. Whether it be local or just period things. And the photos that you've compiled throughout your years of blogging is AMAZING!!! I've enjoyed finding various pictures of various places and things as time has passed. The side point is I'm a huge history buff and I appreciate things like this because it establishes a connection from a previous point. A point where things began or were before and (not many) people really see things that way or appreciate things in that manner. As informative as your blog can be, it's also just simply fun (for failure of a better word to come up with). But to come back to the original point, I definitely love the shirt. 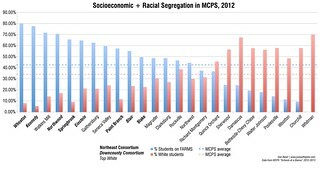 I didn't quite grow up in Wheaton/Silver Spring, but I came in and out of the town a lot due to family being there. And the shirt resembles a time that is almost forgotten. A period of time where things were up and coming and being progressive. And I feel the sign is a great "landmark" that really encapsulates that nostalgic feel. So whenever you do put these out, I'm definitely buying one! (Or two... or four in different colors if available) You can count on it!! !